I don’t know if there’s a better director today than Martin Scorsese. While he doesn’t have a flawless record, Marty’s the man behind Taxi Driver, Goodfellas, The Departed and The Wolf of Wall Street. That’s amazing consistency over five decades, and it’s why I will make it a point to see Silence in theaters. But today, we are reviewing what may be his best. Last week Michael introduced Aaron to Bulworth. 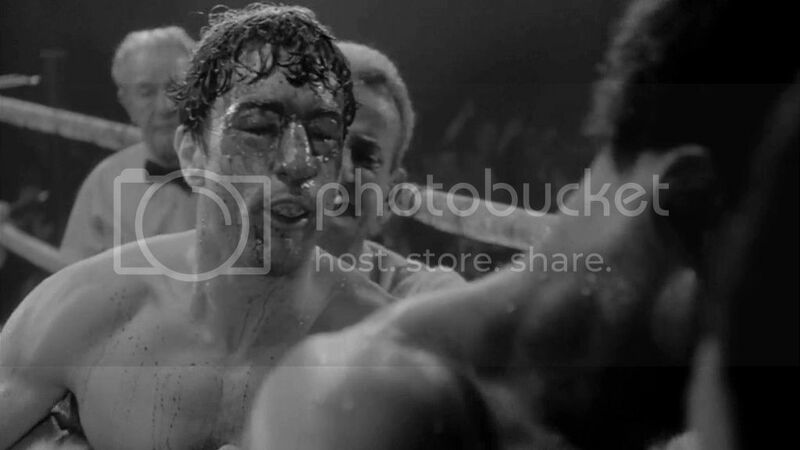 This week Aaron takes Michael out from under the proverbial rock for Raging Bull. Aaron Hubbard: Raging Bull is a film that I told myself I would see before 2016 was out. It was one of the last films I watched, but it immediately soared near the top of my all-time favorites list. I knew I had to share it with Michael as quickly as I could. Michael Ornelas: This film was a challenge to take in because it’s about a man who embodies selfishness and toxic masculinity…but it was really well done and gorgeously shot. I did not like Jake. Not even a little bit. 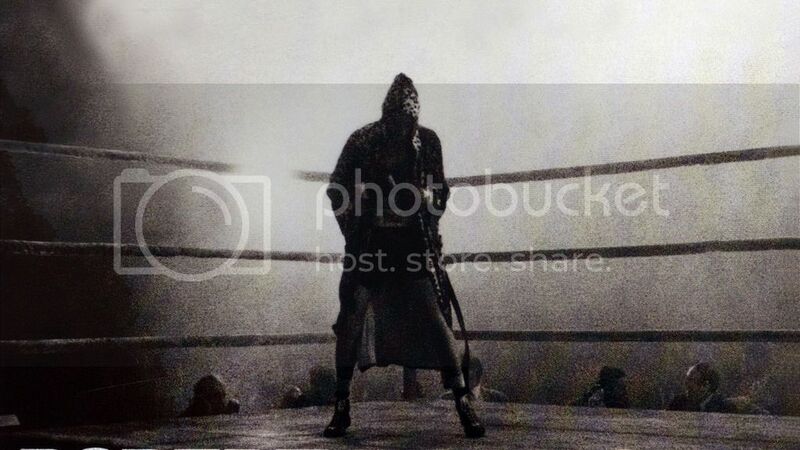 Aaron: This film is adapted from Jake LaMotta’s very thorough autobiography of the same name. As a biopic, the film needs to be about someone who is utterly fascinating and anchored by a strong lead performance. I will say that, in my opinion, Robert De Niro’s performance as Jake LaMotta is the best of its kind, and honestly a top five all-time performance for me. The pure physical aspect (training with LaMotta, gaining sixty pounds for his scenes of Jake in later life) is a big thing, but his expressions, his eyes… it’s incredible. And it’s a tough role to take; we have to feel who this person is and feel for him, while also spending the whole movie terrified of him and what he will do. Michael: Terrified is an understatement. I wasn’t a big fan of Vickie because I felt she was a pretty boring person, to be honest, with a miniscule spectrum of emotions she was capable of showing…but I was so fearful for her safety while she was around Jake. Later in the movie, there’s obviously marital tension to blame that on, but when they’re just starting to date, I still feel uncomfortable. This man is the worst kind of person who values all the wrong things. The most powerful moment in the movie for me was seeing Vickie finally leave him. It was satisfying for me and gave me the ending I wanted, regardless of what came after. Aaron: I find Vickie more interesting than you do, as she is clearly walking on eggshells the whole movie. She’s always been around mobsters, and then she’s trapped with Jake (much like we are). And I agree that it’s impossible to like Jake, but that’s sort of the point. This is a movie about a human animal; the man’s violent behavior, paranoia, refusal to trust or work with anyone, and his eating habits all send him on this self-destructive spiral that’s almost satisfying to watch. Michael: Raging Bull is a biopic and a character piece. Life doesn’t necessarily lend itself to a story with a beginning, middle, and end in the ways we’re used to seeing in Hollywood movies, but Scorsese clearly went to tremendous lengths to take all these moments in one man’s life and find a unifying theme to turn them into chapters of a compelling story. I never felt like the film meandered or that any scene was shoehorned in because Scorsese thought it was too precious to cut. This is clearly a very tight script with an even tighter edit, and at the end of the day, story drives this film forward with almost no detours. Aaron: Scorsese excels at telling stories based on real events. Goodfellas feels like it should be fiction, but it isn’t. Same with The Wolf of Wall Street. I think he chooses his projects very carefully before translating it to film. Raging Bull is an epic tragedy, and while there is more to the Jake LaMotta story, I feel like I know everything that I need to about him. Michael: I was crushed to see his path of destruction. He splintered not only the family he’d created with Vickie, but also his relationship with his brother Joey, who was also one of the film’s best qualities, as Joe Pesci brought him to life in a way that felt completely Pesci, but still like a real person I’d never seen before. The chemistry between brothers in the first half of the movie makes it all the more heartbreaking when Joey won’t even talk to Jake when he sees him outside of a convenience store. Aaron: As fascinating as Jake LaMotta is, and as good as the cast is, what sticks out most to me is the filmmaking. The technical aspects of this movie are just phenomenal. I told Michael ahead of time that this film probably has my favorite cinematography and editing; where the actors are in the frame and when the cuts are made make all the difference in how this story is presented. This is most pronounced in the boxing scenes, which feel more real, brutal and personal than in any other boxing film I can recall. I legitimately cringe several times, and that’s thanks to everything working so well. But the boxing is just an extension of LaMotta’s home life; it’s where he’s most comfortable, able to unleash his anger without consequence. It’s the scenes out of the ring that really stick with me. Michael: I still don’t know how they did the spurts of blood out of the actors’ faces. It was a technical marvel to see the effects and the camera work so poetically with the performances. The execution of this movie was like a dance: everything had to line up perfectly to turn it into something beautiful. The separate pieces of this film are ugly: the fights, the people (specifically Jake), the circumstances…but there’s something captivating about seeing it all packaged with true artistry. This is one of few instances where I feel the fact that a movie was in black and white augmented its visuals (unrelated: if you haven’t seen Mad Max: Fury Road – Black & Chrome Edition, I *highly* recommend doing so. The original is colored so beautifully that I didn’t think I’d enjoy black and white, but it’s arguably just as beautiful). No color forces us to focus on content, both in the ring and at home. Aaron: Any color would be distracting, and the film only uses it for the blood red title scene and for home videos (emphasizing how they are not authentic). I can’t imagine this film in color. But what’s fascinating to me is the framing, and what Scorsese and cinematographer Michael Chapman choose to include in frame. The film is always shot so that there is Jake and an opponent; Joey, his two wives, the mob members, and himself when he has to look in a mirror. Jake is almost always on the right side, giving the illusion of forward momentum and emphasizing his aggression. One of the most striking shots to me is when he brings Vickie home. She sits across from him at a table, trapped by it and a third chair that’s just enough off center to be facing (and thus threatening) her. As she moves closer, she only gets more boxed in by the other objects in frame. Another scene that strikes me is when Jake confronts his brother about the fight at the Copa and first accuses him of sleeping with Vickie. Jake leans over a broken TV, dominating the frame and breaking everything around him. Joey sits on a couch, with a desk to his left trapping him, and cornering him (like a boxing match). The desk has a lamp with a pleading woman, which symbolizes Vickie, and how Joey is between Jake and Vickie, both in real life and in Jake’s warped brain. I could go on and on, but I think you get the idea; this movie is a master class in filmmaking. Aaron: I’ve watched this film twice in the span of three weeks, and I absolutely love it. Robert De Niro is at his best, Scorsese is at his best, and everything just works for me. It is an admittedly difficult watch, a film that made me want to take a shower afterwards just to cleanse myself. But it’s just as close to perfect as I’ve seen any movie get. Michael: I’m really struggling with my grade here. On the one hand, this was an expertly-crafted movie with every frame planned with precision. The emotion and tension are high throughout…but it’s such an ugly story about a bad man and the movie bothered me. I don’t like watching domestic violence, and while I’m never going to tell a movie that they shouldn’t include a scene just because the subject matter is unpleasant, it’s impossible for it not to affect my viewing experience. So my rating will reflect that. Aaron: I don’t hold that against you at all. Raging Bull is a film I actively won’t recommend to people who are vulnerable to trauma. It feels so real, I can’t imagine not being bothered by it. Michael: I’m not even that vulnerable to trauma usually, which makes an even stronger case for it I think. What is the best sports movie ever made? Michael: This next film is a treat that I’ve been waiting to show you for awhile. Aaron Eckhart delivers what I think is his best performance by a long shot, and he’s a pretty talented dude. Aaron: Hell yeah. I’ve been meaning to catch this one for years now. One of the most eye-catching titles in recent memory. 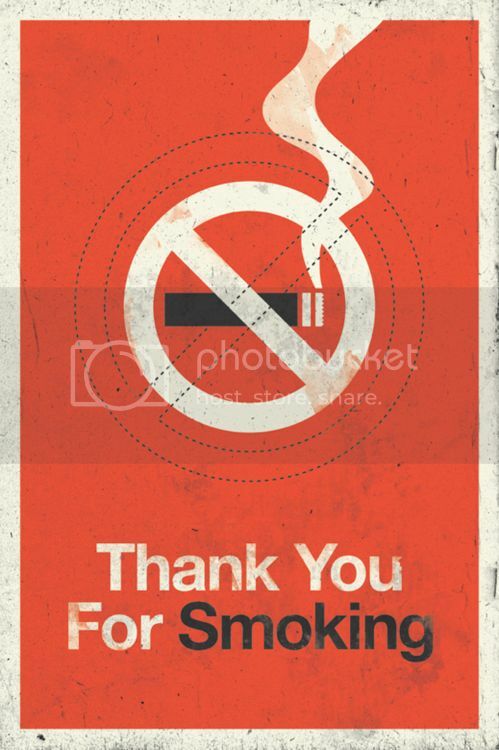 How can anyone pass up a movie called Thank You For Smoking? Michael: A lot of people did. But they were wrong for doing it. What’s your favorite satirical comedy? Taken For Granted takes a look at Chinatown this week. Next week, I’ll be looking at another Scorsese classic; Taxi Driver. 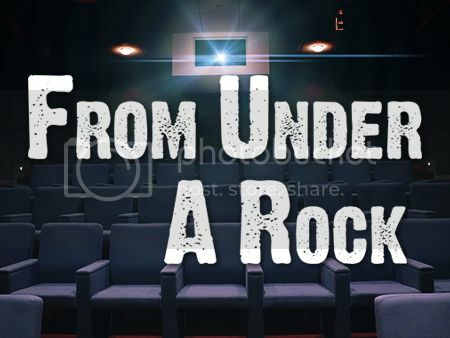 Check me out here to see my ratings on close to 700 films. Recent reviews include Superman Returns, The Tree of Life and Long Way North. 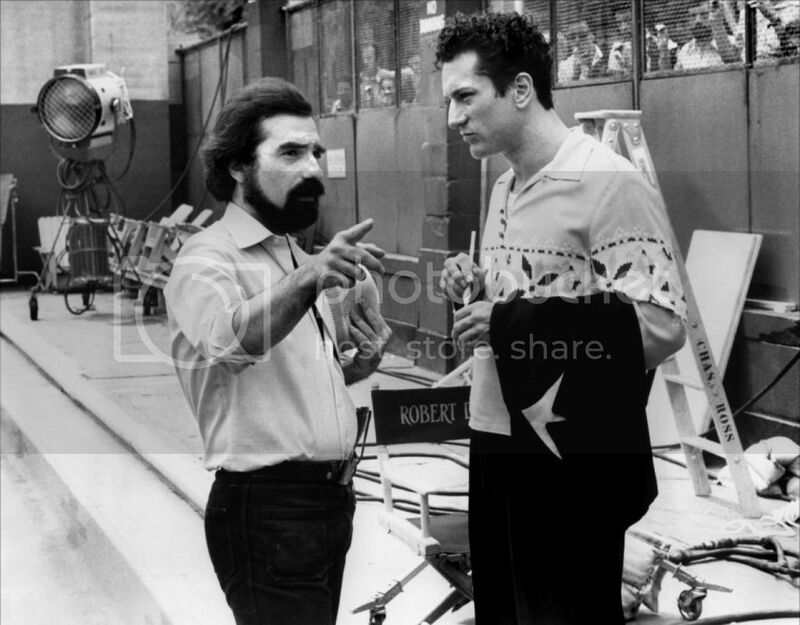 Raging Bull is one of Martin Scorsese's best films, which puts it in serious consideration as one of the greatest films of all time. Robert De Niro gives the performance of a lifetime as the violent, paranoid animal that is Jake LaMotta. It is uncomfortable as film gets, and probably not for every viewer. But as a piece of art, it's an incredible film.